Today I am joining Between Naps On The Porch for my first Tablescape Thursday. 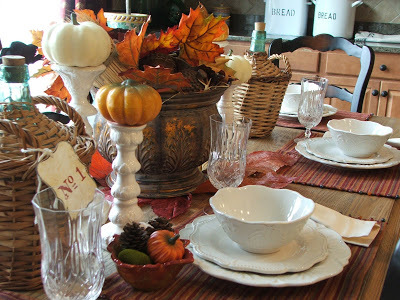 Take a look at this great site for some wonderful tablescapes. I really do enjoy Thanksgiving and I look forward to seeing my family. Though I am anxious for it to be over so I can start decorating for Christmas. Has anyone else noticed that the shops have NO Thanksgiving decorations out? It appears they skipped this holiday and went straight to Christmas. 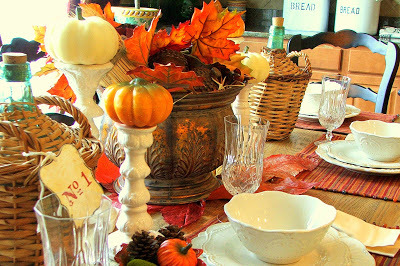 Enjoy my tablescape & and have a HAPPY THANKSGIVING. I think you did a great job with your tablescape. I adore that wine jug wrapped in wicker. The number is a nice touch, too. You and I are on the same page with our pumpkins. I like how you used yours on candlesticks. I used mine on little bronze stands. Neat table, too…. love the rustic wood. That white china from Penney's is just neat as can be. I love white china. I'm with you, though, I'm ready for Christmas! Happy Tablescape Thursday and Happy Thanksgiving, too! (I almost said Halloween… where is my brain???)! Beautiful tablescape. Don't wish it away. Enjoy a great day. Christmas will be here soon enough. Congratulations on your first Tablescape Thursday post and welcome! I hope you'll participate again and again. Your Thanksgiving table looks so warm and inviting! I also enjoyed your Sears catalog post. It was fascinating to see the descriptions (and prices) of the china and flatware in 1940.
beautiful dishes! it all looks wonderful, hope you have a happy holiday. 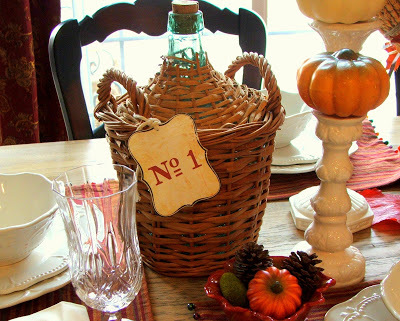 Ohhh…your Thanksgiving table is really beautiful! 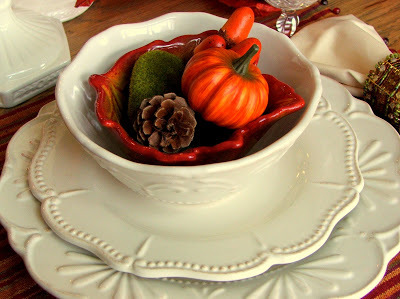 I love your place settings…love that pretty orange leaf bowl full of pumpkins and pinecones set inside the white bowl!!! 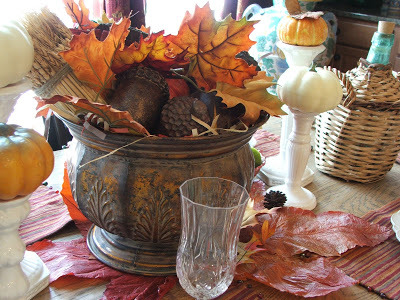 And…that urn full of acorns and autumn leafs…gorgeous! It makes for a lovely Thanksgiving centerpiece!!! Yes…I love Thanksgiving but I am anxious to get started on Christmas! It really is sad though…that the stores seem to skip right through Thanksgiving! Well my friend, I hope that you and your family have a wonderful Thanksgiving! great first tablescape post, it looks lovely! Gorgeous table! I love your dishes. The colors you used are perfect for the season. Thanks so much for sharing! I always love white on white. You can adapt it to anything. You did a wonderful job with the thanksgiving theme. I'm bad at wishing things away too. I get beside myself when I have a whole house full hoping everything to be perfect. I don't think anyone but me really even notices!! So I've got to get better at enjoying the moment too.